Global Healing Exchange is dedicated to empowering ordinary people with online holistic resources to help them learn how to heal holistically and effectively and live a more holistic life. We work with holistic therapists, practitioners and doctors to connect them to the people that most need their unique services, knowledge and skills. As children we are taught to go to the doctor when we feel unwell to tell us what to do but is there a way to empower ourselves? Through holistic therapies, GHE has helped many people learn how to lead a healthier life. 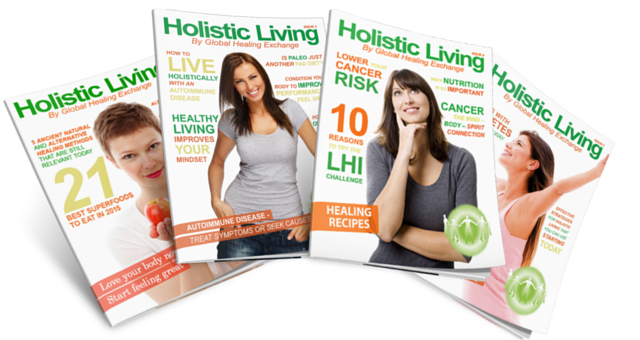 We have our own Holistic Living Magazine written by our experts. We believe that people want a place to come, where they can trust the treatments and information they are getting. We have top holistic health and wellbeing experts that contribute to help you live the life you are dreaming of. You can join our FREE RUBY MEMBERSHIP where you gain access to Holistic Living Magazine’s past and future editions. Or you can UPGRADE to our EMERALD MEMBERSHIP where you pay a monthly fee and get access to podcasts, videos, webinars and articles from our experts PLUS gain access to our private community. They will answer your questions and talk about topics you want to talk about or learn. We aim to empower you with knowledge so you can make the correct decision for you about your health and wellbeing. Global Healing Exchange is a company devoted to teaching you how to live a healthy life. The Founder, Sharon White also works one on one with her clients through her Personal Emotional Freedom Program. Her clients really want to transform their lives, heal their emotional issues and truly live the life they dream of. You can work with Sharon or you can work with some of her other health and wellbeing experts that will help you transform your life in other areas. We share our information in our bi-weekly newsletters. Through her coaching programs, Sharon helps her clients to become EMPOWERED. Her overall mission is to inspire and educate you to have a healthy life, free from the bonds of your past which enables you to have more fun, health, happiness, see the possibilities before you and reveal your magnificence! GHE aims to create a community both online and off-line with people who want to heal naturally and are curious and open-minded about holistic therapies. GHE is a place you can come to gain access to some of the greatest healers on the planet. GHE makes healing fun and effortless. You can find healing information and the therapist that feels right to you. GHE is a place where you can invite your loved ones to join our community to aid their healing too. GHE gives you information you can trust. GHE believes in EMPOWERING its members. Love what they do and are leaders in the health and wellness industry. Who are FUN to work with. Who come from the heart. Who have a strong work ethic. And most importantly, we love to work with people who want to make a difference in other people’s lives. Fun – Life is all about having FUN. We choose to work with people who have a sense of fun. Life does NOT have to be serious! Healing – We are passionate about healing. We are all on a healing journey. We have a community of people dedicated to teach about healing our bodies holistically. Open-Hearted – When we are open-hearted we can give and feel love. This is where true healing and a sense of community begins. Expert – We choose to work with experts. At GHE we give top quality information by top quality experts. Trustworthy – The web can be a wealth of information but what can you trust? At GHE we choose to work with AMAZING people who you can trust. We will give you high quality and trusted information from experts in the alternative health field to help you learn about holistic healing. If you want to be a part of this wonderful, empowering, healing community, we would LOVE to see you on the inside. You can also read our FREE Holistic Living Magazine here.